Fluidic applications carried out in tanks – like fermentation or storage – often require the precious media to be protected from reacting with air, oxygen and other ingress. A pressurised inert gas layer above the media serves to maintain a stable chemical balance. This process is known as tank blanketing and commonly utilised in pharmaceutical and biotechnology industries. Building upon the new hygienic control valve Type 2380 , a truly robust system is in charge of increasing safety levels in tank blanketing and many more demanding applications. Although a seemingly simple process on the surface, the strict requirements with respect to cleanability and cross-contamination prevention – mandated by the highly regulated pharma and biotechnology industries – introduce a new level of complexity to this application. Standard off-the-shelf components typically used for tank blanketing inherently cause issues with cleanability, are highly susceptible to contamination and can result in risk issues an erratic failure rates due to naturally acidic carbon dioxide or other aggressive foam upon exhausting. They are simply not fit-for-purpose. Downtimes, maintenance costs and comprise of product quality are all risks introduced by utilizing the common standard solenoid components. 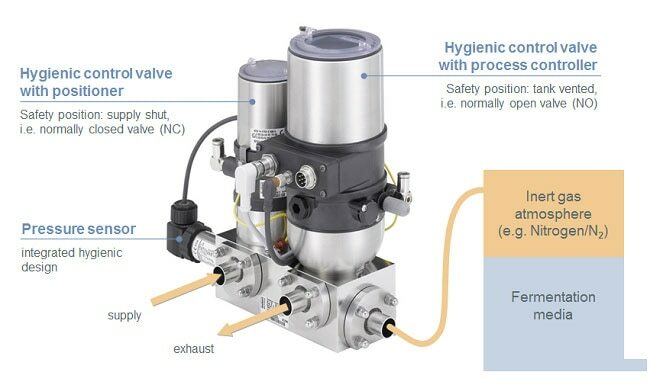 Liberating pharma and biotech manufacturers from these heavy drawbacks, the Bürkert hygienic control valve system is in full charge of rapidly increasing safety for tank blanketing and virtually any pressure, flow and filling control application in clean environments. Downtimes and maintenance costs due to corroding exhausts will be eliminated by the system’s robust design. Uptimes and precious productivity will in turn be vastly increased in all of these applications. Considering in non-solenoid alternatives, one will find rather heavy and bulky devices. In contrast, the incorporated valves Type 2380 weigh as little as ¼ to ½ of an alternative and save 83% of space in comparison. This means more flexibility in design with a clear focus on process productivity. Naturally, the durable tank blanketing system is fail-safe, tested CIP/SIP capable and fully hygienic design (GMP, FDA) compliant – for all-time high safety levels. At Bürkert we thrive on understanding our customers in order to deliver tailored solutions, which perfectly meet your needs and exceed your expectations. Integration of valves, sensors and logic is our specialty setting Bürkert apart from competitors. Sit down with us, tell us your ideas – and we will make them flow. The system itself builds upon two hygienic control valves of Type 2380. These compact, lightweight and CIP/SIP-capable valves are suitable for virtually any pressure, low-flow and filling control application in hygienic environments. 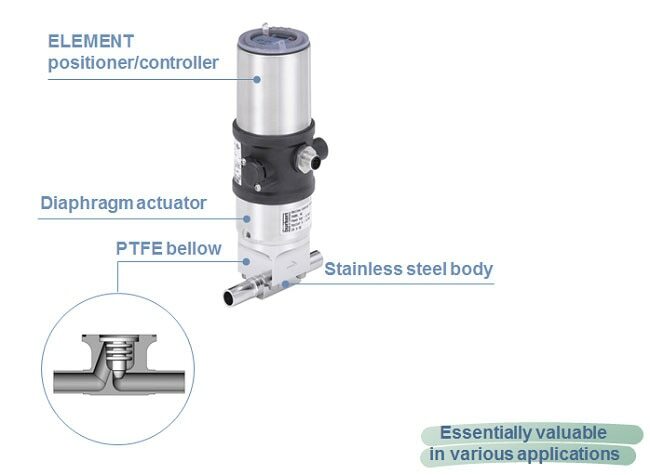 The standard control valve is a new addition to the unique ELEMENT system; in combination with four different Type 869x positioner and process controllers of the ELEMENT series, as well as different connections (sleeve, clamp and welded connection) and a large choice of bodies and block solutions, it enables creation of a modular system with numerous options. Designed exclusively around hygienic requirements, the ELEMENT design has become an industry standard. Rounded stainless steel surfaces, internal air routing, wash-down resistance and a hermetically sealed process boundary (high IP 65/67 protection) keep it all safe. Benefitting from ELEMENT design, these control heads are not only durable in chemical wash-down environments but also equipped with preventative maintenance measures to monitor cumulative travel and valve stroke count. They can operate autonomously with an integrated process controller or be easily added into a modern PLC fieldbus network. High controllability allows fully reproducible, automated processes. The compact diaphragm actuator in use yields lowest hysteresis, a unique benefit especially for smaller valve sizes in terms of stable reliability levels. Superior reliability plus process safety: Wetted parts and process connections match hygienic needs. Protecting precious media from the environment, the PTFE eliminates contamination risks. Being robust against corroding supplies/exhausts like the naturally acidic CO2, it is suitable for virtually any media, SIP-capable – and comes with all necessary approvals (FDA, USP class VI). Made from 316L steel in various sizes with port connections according to ASME-BPE, ISO and DIN. Self-drainability in vertical position and smooth curvatures allow hygienically safe operation and cleaning.